The pages about the Angenieux 28-70 zoom lens have been the biggest hit of this blog so far. Manufactured in relatively small volumes by a renown French company, this lens disappeared from the shelves in the mid nineties, only to resurface – slightly modified – as an AT-X Pro after Tokina bought the design. So says the legend, at least. 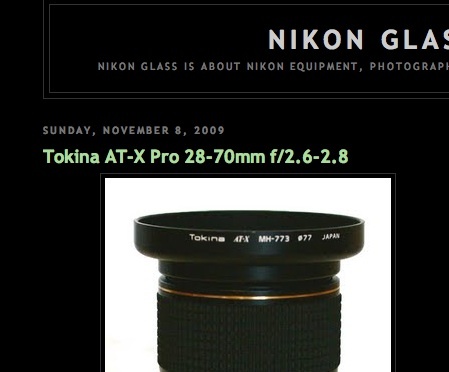 More about the Tokina AT-X Pro saga can be found in a page published in November by John Cazolis in his blog Nikon Glass. John explores the different versions of Tokina’s 28-70 zoom, and tests extensively the AT-X Pro 28-70mm f:2.6-2.8, which is considered the closest to the original Angenieux design. There are always a few Tokina AT-X Pro 28-70 lenses for sale on eBay, but the first iteration of the Pro model – the one that John Cazolis recommends – is relatively difficult to find. Expect to pay between $200 and $300 for a nice lens in good condition.